We provide collision reconstructionists with exemplar vehicle measurements for crush analysis. Our exemplar package includes high-quality photographs, completed Photomodeler and iWitness photogrammetry projects, and a DXF file for CAD. We provide collision reconstructionists with exemplar vehicle measurements for crush analysis. Our exemplar package includes high-quality photographs, a completed Photomodeler photogrammetry project, and a DXF file for CAD. 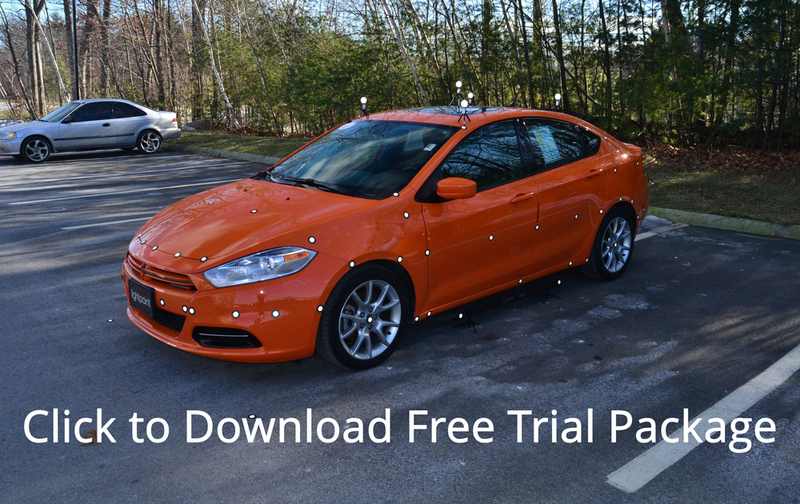 Each purchase includes the high-quality photographs used to create the vehicle photogrammetry model, showing the placement of each target, so you know exactly what was measured. A complete Photomodeler project comes with each exemplar vehicle, including the related camera calibration file. Whether or not you're a photogrammetry user, this supplies the support for your exemplar measurements. Complete 3D DXF files that can be imported in to any CAD program for straightforward crush measurement. Simply merge our DXF with the drawing of your damaged vehicle to obtain crush depth.